Have you ever felt this way? Tired of trying to keep up with the Joneses, stressed that your kids need to be in three places at once, and just hoping for a weekend off for a family meal? If so, you are not alone. There is a lot of pressure on parents these days. We want the best for our children and we don’t think twice about taking action when we see we’re able to fill a need. But are we doing enough? Are we giving our kids the best chance of success? It’s enough to drive you nuts. But what if you could do more, simply by doing less? At Changing the Game Project we believe being a successful sports parent has nothing to do with who buys the more expensive equipment. Success is not who compiles the longer list of camps and clinics, whose kid makes the “A” team at the youngest age, or who posts the most pictures of kids with trophies on Facebook. Shouldn’t we have a similar definition for parents? Not the best parent compared to so and so, but you, the best parent you can be with the talents and resources that you have. Be the best parent that you are capable of becoming, with all you have going on in your life. You don’t have to do everything under the sun for your kids to be a successful parent. You don’t have to give up every weekend and every vacation. It doesn’t mean you have to get a second mortgage to send your kids to six camps next summer. And it certainly does not mean that what team your kid makes, or how many trophies he or she wins is a reflection upon whether you are a good parent or not. It simply means doing your best, maintaining family balance, and watching your child succeed and fail without taking it personally. It doesn’t mean paying for more; many times it actually means doing less. 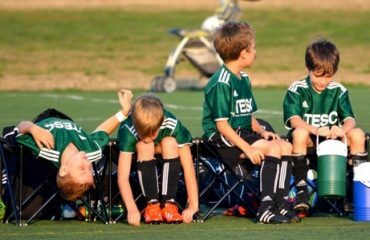 Here are eight things you can do to increase your child’s chances of finding success and fulfillment in their sport that won’t cost you a penny. The best part, though, is they will help you fulfill your role as the parent of an athlete while at the same time making it all the more enjoyable. Be a positive role model for your child. Sport should be an extension of your familial values and behaviors, not a suspension thereof. Be an encouraging parent. Don’t talk badly about competitors or loudly second-guess the coach. It’s okay to appreciate the athletic skill of a competitor and you are not a traitor for acknowledging another athlete has talent. There are enough uninformed critics in the stands hurling insults at kids playing a game, so instead set the example for others. You are looked at just as much by other parents as your athlete is, so be the fan your child needs you to be. 2. See the future, but enjoy the present. Are you consistently looking towards the next level, the next team, the next season? If you are, you’re missing out on the most important game, the one being played today! If you’re not enjoying the present moment, your child will grow up before you realize it; if you don’t squeeze every ounce of enjoyment out of their development as a person, you’ll regret it. Be a parent who enjoys the now, and let the coach be the one who is looking to the “later.” Leave them alone on the ride home from games. Take your athlete to the court and let them teach you something. Throw the ball around the yard while you swap stories and get to know the social side of each other. Lots of smiles with no judgment during fun play will relieve stress for you and your athlete and also create special bonding moments that only an athlete and their parent can share. 3. Encourage risk taking and find joy in the effort. Competing leads to winning and losing, thus competing is inherently risky. Don’t downplay the importance and challenge of risk taking by saying “Great job out there, maybe you’ll get it next time.” That’s vague encouragement and not helpful to an athlete’s development. Instead say “I love how you really went for it out there on that one play. You didn’t get it, but I was so proud that you didn’t give up!” Strong, specific words of encouragement remind an athlete it’s okay to take a risk and fail so long as she did all she could to be successful. 4. Celebrate the competitor above the winner. The difference between losing and getting beat is in the effort expended during competition. A competitor never loses; they get beat, and getting beat fuels the competitor to improve. In every game, there is a winner and a loser. Defeat can be the seed of discontent your athlete needs to be motivated to work harder and smarter next time. Legendary volleyball player and three-time Gold Medalist Karch Kiraly spent his teen years playing beach volleyball against grown men. He didn’t win… at first. Winning was not the goal; development was. In the beginning, Kiraly and his partner celebrated scoring 3 points in a match. Months later, they celebrated scoring 6 points in a match. A few years later, still a teenager, Kiraly wasn’t only competing against professionals but beating professionals and winning tournaments. When your athlete plays a level above her ability and does well, that effort should be celebrated, regardless of the result. A true competitor should always look to “play up” a level, whether in practice or on game day. The expectation should be for her to compete at the highest level she can. Excellence breeds success; a focus upon success rarely yields excellence. 5. Foster independence by allowing your athlete to take ownership. Autonomy is one of the three key ingredients of long term athletic success. Goals and expectations are great tools if used properly. However, if your athlete is constantly trying to live up to your expectations it could lead to her believing your happiness depends on her performance. Believe it or not, by taking a step back, you give your child the room to step forward and claim the sport for herself. An elite athlete experiences enough pressure to perform well from his teammates, the coaching staff, and from himself. He doesn’t need the added pressure of an overzealous parent with good intentions! Allowing and fostering independence is critical. There’s no escaping the mean, evil-spirited opinions, the rude comments, and the difficult situations that will confront an athlete. The sooner she learns to stand on her own and not always have you to lean on or hide behind, the better. 6. Treat the coach as an ally, not an adversary. If you treat the coach as an adversary, how do you think your athlete will treat him? You and the coach want the same thing: for your athlete to be successful (though you might see different paths to making that happen). Once you know that the coach values your child not just as an athlete, but as a person, then step back and let him or her coach. You won’t always agree with every decision, and your child may struggle at times, but instead of saying “what’s wrong with this” try “what’s good about this?” There is always learning to be had if you look close enough. Working with your coach by keeping him or her informed, and respecting boundaries, actually gives your child the best chance of success. Eventually, all athletes have to one day turn in their jersey and find a new passion. Very few elite athletes play beyond college and an infinitesimal number make decent money playing professionally. An education is not a backup plan if athletics doesn’t work out: it is the foundation from which your athlete will build a life upon, athletics or not. Sports goes by way too quickly, so enjoy every moment. Do so by simply saying “I love watching you play.” It changes everything (watch this video if you don’t believe me). If you have given your best, and you can say to yourself “I have done what I can while maintaining sanity, health and the well being of my family and relationships,” then by all means you are a successful sports parent. Stop looking at Facebook, and comparing what your house looks like on the inside to what everyone elses house looks like on the outside. Simply take a step back, let the athletic journey belong to your child, and give your best effort. Just do your best, and have fun doing it. Not only will your kids notice it. And that is the ultimate reflection of success. So what do you think? Please share a comment below.